Conquer the sport of business! I'm a huge sports fan, so I spend a lot of time reading about about sports teams and athletes. I love to read articles and stories about championship teams and players and what helped them to become the best. Much can be gleaned from sports franchises and athletes that relates to winning in business. Of all the sports that are played in the world, golf is probably the one that is most similar to entrepreneurship (especially businesses that only have a few employees). I say that because every weekend golfers have to compete against dozens of other golfers who are the best at what they do. And unlike sports such as football, basketball, and baseball, in golf there is not a team of people that you can rely on to win the game while you're playing. Even though golfers have coaches, advisors, and assistants, they can't come with them on the course. 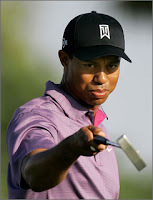 "So how has Woods continued to elevate his game, even after reaching the No. 1 ranking? Fellow athletes, sports analysts, business leaders and others say he's done so by meshing his considerable physical talent with a combination of focus, commitment, strategy and nerve that is unlike anything they've ever seen." The mind game: Never stop learning and don't let anyone out-think you. Finding motivation: Cultivate an internally-motivated, passionate, relentless, "refuse-to-lose" attitude. Fit and rested: Take care of your body, because your health is the most important thing that you have. Confidence to change: Don't be afraid to mess with success, especially when you know you can get better. A unique talent: Determine the special qualities that you have/need to be the best. I believe that you if you diligently and consistently apply these principles, just like Tiger you can also get to the top of your profession or industry. For those of you who would love to go to a small business conference, but don't have the time or the money, here's the perfect solution for you. The Microsoft Small Business Summit is a FREE online conference that will provide powerful advice and valuable secrets to help you start or expand your business. The dates of the summit are March 24th - 27th, 2008. Visit www.sbsummit.com for more information and to register. The best part about this whole event is that you can join in from the comfort of your home or office. And did I mention that it's FREE! Don't miss out on this great opportunity to gain some new insights and perspectives to help you launch or grow your dream. Register and view online at www.sbsummit.com. Excitement gets you started, but passion keeps you going. Is your business as successful as it has the potential to be? Are you as good of a leader as you can be? Are you on track to accomplish all of your 2008 goals? If your answer is "no" to any of these questions, I would ask you the simple question, "why not?" I know that there could be many reasons (or excuses) as to why you may have answered no. You may have challenges with time, money, focus, help, procrastination, or any of the other typical excuses that are used when it comes to talking about why we haven't done something. Taking into consideration those reasons that are legitimate and the ones that are not, I believe one of the key reasons that you have not yet accomplished some of your goals could be your lack of passion. You might be reading this and think it foolish of me to write that an entrepreneur or businessperson could lack passion for what they do. I'm not raising the question about your passion for the object of your business affection. I'm raising the question about your passion for your commitment to doing what you do even better. Reading and listening to the jargon of the business world, I see many words that are often overused and misused. One of the most frequently overused and misused words is passion. Many people think that passion is just having excitement or a strong emotional connection to something. However, having a true passion for something is much bigger than just those two things. The passion I'm talking about is an intense commitment to see something all the way through to its completion or fulfillment. It is demonstrated through endurance and a willingness to fight for what you believe in. True passion won't let you stop fighting until you accomplish your goal, dream, or vision (read "Fighting for Your Dream"). Passion not only helps you to determine what ideas to say "yes" to, but it also helps you determine what ideas to say "no" to. In business it's easy to find many concepts and ideas about which to get excited. However, not all of those things would you - nor should you - be willing to invest the time, money, and energy to see them through to their completion or fulfillment. For the things that you would say yes to, real passion transfers excitement and emotion into action. One of the things that passion should help you say yes to is continuous improvement of yourself and your business. Passion for continuous improvement means never being satisfied with what's already been accomplished. It means waking up every day asking yourself the question, "how can I be better today?" It means that "good" is not good enough. It means looking in every nook, corner, and crevice of your business for ideas, fixes or tweaks that will help you to lower your operating costs, upgrade your products, or enhance your services. While most entrepreneurs probably would agree with me that continuous improvement is important, many haven't yet made the commitment to it (or maybe they think they have even though they haven't). One reason that I say this is because of the failure rate of small businesses. Based on my personal interactions with small businesses, this failure rate is somtimes driven by the owners' unwillingness or slowfulness to improve their products or services. Another factor is that they are too busy working "in" the business to work "on" the business, which would limit them from being able to see their operations from a broader, strategic perspective. Product/Service differentiation: Becoming better, faster, or cheaper than your competitors. Customer service: Exceeding customer expectations cost effectively. Marketing: Attracting, capturing, and retaining new customers. Operations: Streamlining your processes and increasing your productivity, allowing you to handle more customers or orders with the same or fewer resources. Decision making process: Data and fact-driven decision making versus subjective, opinionated or anecdotal decision making. Employees: Creating an attractive, engaging, fun, challenging, and safe-to-fail work environment. Personal development: Utilizing structured and informal means to facilitate lifelong learning and skills development. One of the key benefits of having a passion for improvement is that it can spark profitable innovations in your business. Innovation requires that you be dissatisfied with the status quo. So when you have an intense desire to always get better, your creative abilities can released and directed toward those areas in your business that need to be improved or enhanced, producing financially rewarding solutions for you and your customers. Leaders are learners and there is always something new that you could learn to help you or your business do something better. No matter how successful you or your business becomes, you must always have a passion for continuous improvement. In my previous post, I wrote about the need to grow or else your business could be left behind in this challenging, always changing marketplace. Some of you may have read that and said to yourself that your goal is not to get big. I understand that, because every small business owner doesn't necessarily have a goal or desire to become a "big" business owner. Regardless of whether or not you want to get bigger as a company, you still have to be able to outperform your competition if you plan on being in business for a long time. One of the keys to outperforming your competition is differentiation. Another way to say differentiation is competitive advantage. Your competitive advantage can be demonstrated in various areas of your business, including product innovation, service quality, marketing, pricing, or operational efficiency. If you are able to effectively leverage the value of your differentiation or competitive advantage with your customers, you will be well on your way to growing a healthy company. You may be asking how the title of this post relates to differentiation. I recently wrote a post entitled, "Turn a Great Idea into a Great Business", in which I explained how entrepreneurs could incorporate into their businesses best practice principles from the book Good to Great written by Jim Collins. The "Hedgehog Concept", one of the key principles that Collins details in the book, is a powerful model that a small business can use to develop a differentiation strategy. Let's take a closer look at this concept. 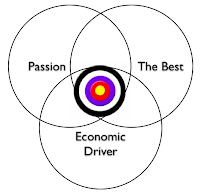 What is our company deeply passionate about? What can our company be the best at doing? What are our economic drivers, i.e. products or services that will generate consistent cash flow and profits? "[Hedgehogs] simplify a complex world into a single organizing idea, a basic principle or concept that unifies and guides everything. It doesn’t matter how complex the world, a hedgehog reduces all challenges and dilemmas to simple - indeed almost simplistic - hedgehog ideas. For a hedgehog, anything that does not somehow relate to the hedgehog idea holds no relevance... They understand that the essence of profound insight is simplicity... Hedgehogs see what is essential and ignore the rest." As it relates to growing your business, the issue is not about what you could do, but what you should do. If you have a current strategy or new idea that only satisfies one or two of these questions, your business model is not balanced. Companies that lack passion, skills, and/or profits might be able to operate like that in the short term, but eventually they will have major problems, because anything that's not balanced will fall over in time. The criteria for any new strategy, idea or opportunity into which you would invest time, money, or people should be that you can answer all three questions confidently. So, as you think about how to grow your business, I encourage you to spend some quality time wrestling with these questions in order to find your business hedgehog. Then you'll really be ready to grow!